A group of Vancouver men in hot water with U.S. authorities for allegedly walking out to a hot spring in Yellowstone National Park have apologized for their actions. U.S. park rangers have filed a criminal complaint against Charles Gamble, Alexey Lyakh and Justis Price-Brown, alleging they left the park's boardwalks and stepped on a geothermal feature to take photos and video. An affidavit sworn in U.S. court says a witness provided photos and a video captured on Saturday. 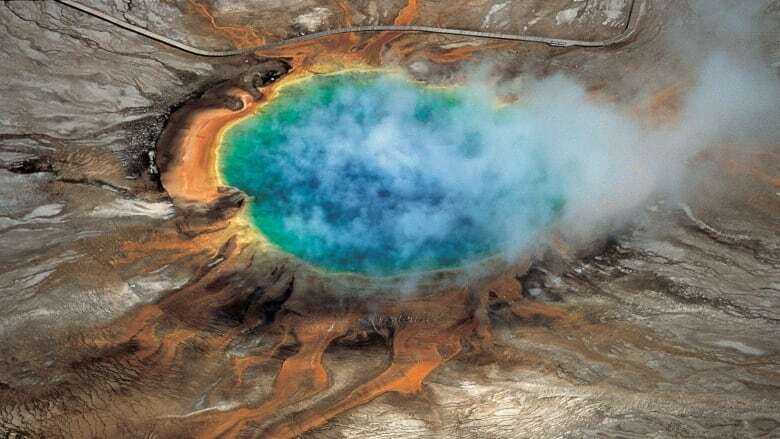 It allegedly showed several people about 23 metres off the boardwalk near the Grand Prismatic Spring. None of the allegations has been proven in court, but the four Vancouverites have taken responsibility for it. The accused are all members of a clothing and outdoor adventure company known as High on Life SundayFundayz, which has been travelling the U.S. and shooting footage in the hopes of inspiring others to explore. The men posted an apology on Facebook for making the "​unfortunate error of leaving the pathway" and described themselves as "overzealous" in their enthusiasm for getting the perfect photo of the natural wonder. "We did not respect the protected environment we were exploring, and we want to acknowledge our wrongdoing," the men said. "We have spent a year saving for and planning this project. The last thing we intended to do was to disrespect this beautiful place." "We wandered off the laid out path and took photos of the Grand Prismatic Springs, unaware of the ecological ramifications and safety precautions," the men added in another Facebook post. "For this, we would like to sincerely apologize to the Yellowstone park community and the public." The group has taken down the footage showing them wandering off the pathway, saying that they will be donating $5,000 to Yellowstone National Park. But their apology has not gone down well, with their own Facebook posts prompting a backlash of thousands of comments. The Grand Prismatic Spring is Yellowstone's largest hot spring, measuring approximately 112.8 metres in diameter and is over 37-metres deep. The park has several signs warning visitors to stay on the pathway and boardwalks.